BioOhio is excited to announce our popular legislative networking event for BioOhio members only in the beautiful Ohio Statehouse Atrium. A unique opportunity to discuss the impact and importance of Ohio’s bioscience companies, research institutions, and educators with state officials and lawmakers. Please join us in representing and advocating for the bioscience industry’s continued growth in Ohio. Networking reception, featuring brief remarks from special guest speakers, with refreshments and hors d’oeuvres, in the Statehouse Atrium. 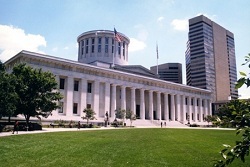 Connect with legislators, their staff, key state officials, and fellow BioOhio members. BioOhio and Colby & Co. will help interested members schedule meetings with legislators in their respective districts. To request meetings with legislators, email jgoldsberry@bioohio.com by March 5. Requests after this date will be considerably more difficult to fulfill.